With an engineering background, Faizal Kottikollon’s journey of success began when he came to the UAE in 1995 to set up his first business – Al Ahamadi General Trading in Ajman. The chairperson and founder of KEF Holdings started a foundry called Emirates Techno Casting (1997) in Sharjah, primarily manufacturing valves for the oil and gas industry. With time, Faizal invested in cutting edge technology and developed processes that were never used in the valve manufacturing business before. ETC went on to become one of the top three foundries in the world. It expanded until it was sold in 2012 to Tyco International for a sum of $400mn. Using this capital he founded KEF Holdings – incorporated in Singapore and headquartered in DIFC, Dubai – with six business verticals: infrastructure, healthcare, education, metals and investments. Metals was KEF Holding’s first business vertical. Established in 1995, Al Ahamadi General Trading (AGT) company became the stepping stone for KEF’s business future. Pre-fab and module construction is a backbone of the business. At Arab Health 2016 the firm unveiled its “Catalogue Hospital” concept for modular construction of health facilities in the region. The idea was devised by KEF-TAHPI Design Studio, a joint venture of KEF Holdings and Australia-based TAHPI. 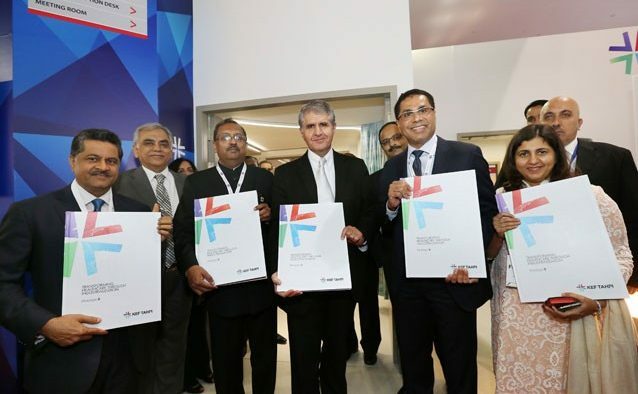 KEF is the first company in India to employ BIM Level 6 integration in its design and build projects. The company is also heavily invested in relief and CSR projects including Haiti Earthquake Relief and Tamil Nadu flood relief.